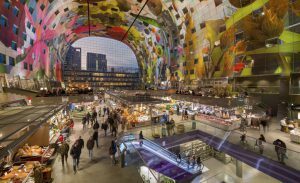 Flattened by bombs in the second world war, Rotterdam has transformed itself into a truly modern city – with spectacular architecture. 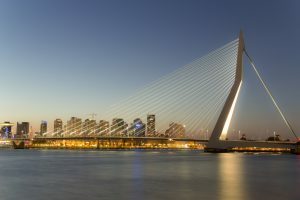 Marvel at the Erasmus Bridge spanning the Maas river. And Rotterdam’s glittering Markthallen is a visual feast for both your eyes and tummy. You’ve probably heard of Rotterdam’s cube houses (Kubuswoningen in Dutch). 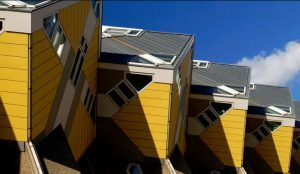 Designed by architect Piet Blom, the beehive houses are based on the concept of “living as an urban roof”. By tilting the cube of a conventional house by 45 degrees, and resting it upon a hexagon-shaped pylon, Blom’s design represents a village. Each house represents a tree, and all the houses together become a forest. The outside of the cube houses can be viewed from Rotterdam’s Blaak street. But there is also a furnished show-cube, where you can see for yourself what it must be like to live in one of these unique creations. 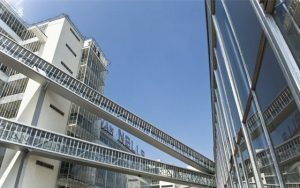 Rotterdam’s Van Nellefabriek has been on UNESCO’s World Heritage list since 2014. This former coffee, tea and tobacco factory was built in around 1920 and was far ahead of its era in terms of its shape and the materials used. The light, air and space in the building had a huge impact on the development of modern architecture in Europe. If you are a music fan – especially a jazz music fan – and have not visited the North Sea Jazz festival then you really are missing out. Every year in July, Rotterdam’s Ahoy event centre is transformed into a mecca for music lovers from all over the globe. Rub shoulders with the world’s best jazz musicians in the most relaxed and low-key setting imaginable. See our top tips for visitor’s to Rotterdam’s North Sea Jazz festival. Rotterdam’s harbour is world-famous. And as the largest port in Europe, it certainly is impressive. The best way to see it for yourself is to take a Rotterdam Harbour Cruise on the Spido. This 75-minute boat trip offers fascinating commentary on the Port of Rotterdam and the history of the city, and offers a spectacular view of Rotterdam’s architecture from the water. Did you know that Rotterdam is home to one of Europe’s most beautiful zoos? Diergaarde Blijdorp is also is one of the top ten zoos in the field of breeding programmes for endangered species.